For anyone that loves restoring early machinery or antique tools, restoring an antique wood lathe could be a dream come true. In its simplest description, a wood lathe consists of two posts fixed in an upright position, each holding a fixed pin. The wooden stock to be turned is revolved with the help of an assistant. The assistant pulls each end of a cord wrapped around the stock in alternating directions. The craftsperson, or cutter, works with his cutting tool to shape the wooden stock. Lathes have been in existence for thousands of years. On the wall of the tomb of Petosiris in Egypt, carved in stone, is the earliest illustration of a lathe that is known to exist, dating from approximately 300 B.C. 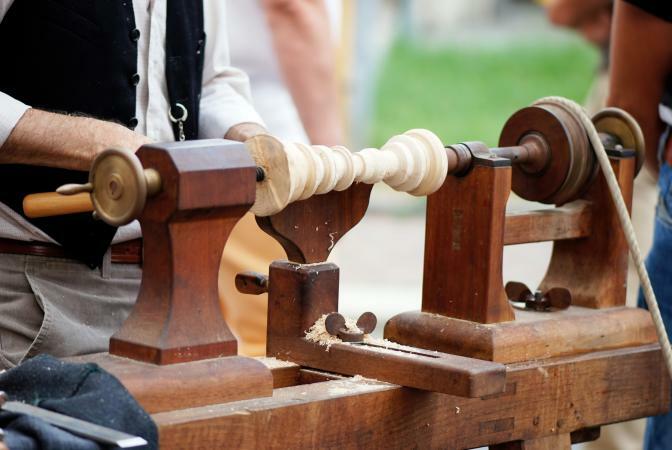 As centuries passed, wood lathes evolved into machines that were wheel driven. The earliest pictures of a wheel driven lathe date from the 1400s. The following century saw a great technological change. Sketches by Leonardo Da Vinci, circa 1480, show an early treadle wheel lathe. The sketches clearly show a crank, treadle and flywheel. Wood turners and inventors continued developing the foot-powered lathe as they also perfected wood lathes run by water wheels and water turbines. By the late 1800s wood working lathes were run by steam engines followed later by engines powered by oil, and finally electricity. Some of the wood lathes restored today are treadle operated lathes from the late 1800s and early 1900s. These lathes are a beautiful combination of wood and cast iron designs, showing the craftsmanship in producing the lathe itself. These functional, yet beautiful, treadle machines often had decorative pin striping and other artwork applied when they were manufactured. Restoration of wood lathes from the early to mid 1900s are very popular and readily found at online auctions such as eBay,as well as locally at garage sales and through classified ads. Complete step by step instructions for restoring a Craftsman lathe, circa 1940s, can be found on The Old Machinery website. This website is a blog called A Vintage Woodworking Machinery Restoration Blog. Old Wood-Working Machines is an excellent website full of valuable information on wood lathe restoration. A pictorial journey of the restoration of a Sheldon wood lathe. Detailed restoration instructions for two Sears Craftsman Wood Lathes, one from 1947 and one from the mid 1950s. The instructions are detailed and helpful pictures are included. Rosini Kingdom Restorations has an excellent supply of restoration supplies. Photographs of Leonardo Da Vinci's wood lathe reconstructed by Stuart King who was commissioned to build it from Da Vinci's sketches. A. J. Wilkenson cast iron treadle lathe from the late 1800s. Dozens of antique wood lathes can been seen in the pictorial section of Old Wood-Working Machines. A reproduction of a wood lathe from medieval times. Restoring an antique wood lathe is a project that is enjoyable and it results in a finished woodworking tool you can be proud to use in future projects. Plus you'll have a great story to tell about your lathe!